BHC Recruitment for Postal Assistant of 99 Vacancies. 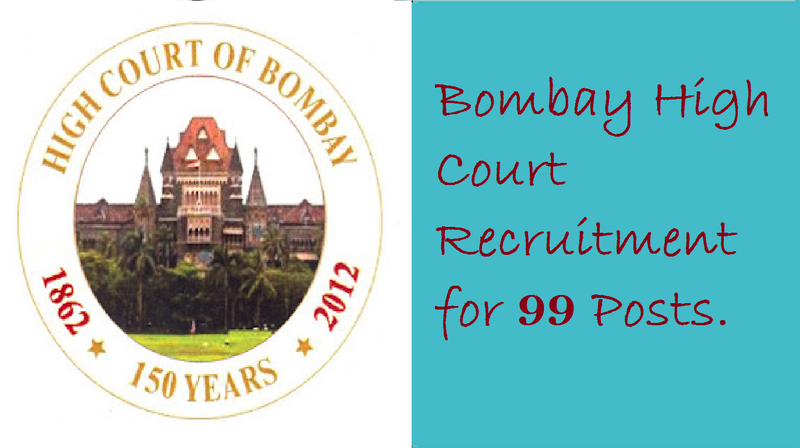 Bombay High Court Recruitment for 99 Posts. The Registry of the high court, Bombay has been granted permission to prepare a select list of 71, 26 and 7 candidates for the posts of Postal Assistant. However, 4%(i.e. 3 posts at Bombay, 1post at Nagpur and 1 post at Aurangabad) are reserved as per the direction issued in the writ petition with PLL No. 72 of 2018 filed for reservation for persons with disabilities. The posts in the questions will be filled in near future as per the notification of the Bombay High Court. By this advertisement, applications are invited online from the eligible candidates who fulfill eligibility criteria on the date of publication of this advertisement, for preparation of a select list of 68, 25, 6 candidates for the posts of a personal assistant in the high court at Bombay and its benches at Nagpur and Aurangabad. आयु सीमा : न्यूनतम: 21 साल, अधिकतम: 38 वर्ष, यानी एक उम्मीदवार का जन्म 02.09.1980 से पहले नहीं हुआ होणा चाहिये और 01.08.1999 से अधिक नहीं (दोनों तिथियां सम्मिलित). ऊपरी आयु सीमा अनुसूचित जाति / अनुसूचित जनजाति 5 साल, अन्य पिछड़ा वर्ग 3 साल, विकलांगों को 10 साल, पूर्व सैनिक को 5 साल. नौकरी करने का स्थान : मुंबई, औरंगाबाद, नागपूर. Before starting filling in the online application, candidates must have his/her latest passport size photo and sign duly in separate files in the .jpg/.jpeg formate in such a manner that file should not exceed 40KB each and shall attach the same at the appropriate places shown in the online application. The online application will not be considered for the advanced post unless online payment or challan payment is made towards application fees. The fees of Rs. 300/- should be paid either online or by challan. The fees shall be non-refundable. Candidates shall be selected on the basis of examination in shorthand, typing and vice-versa. The Shorthand and typing test will be of 40 marks each. Minimum passing marks for shorthand and typing test will be 20 marks each.